Welcome to Study Campus, a renowned educational institute in Mumbai. We are known to offer impeccable teaching methods to prepare our students for various competitive examinations. Our faculty members have years of experience in preparing UPSC students and channelizing their potential in the right direction. 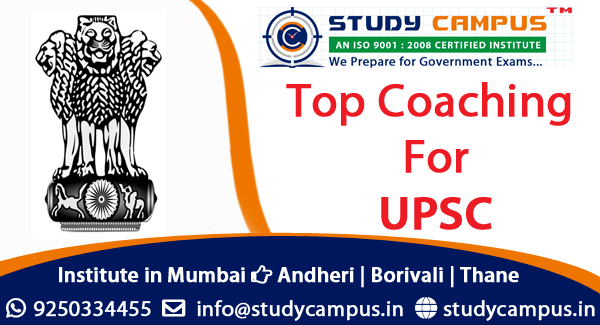 Being one of the best coaching classes for UPSC in Thane, we are also included among the top 5 UPSC preparing institutes across Mumbai. Becoming an IAS officer or an IPS officer is a dream of many, but not all are able to fulfill their dream. At Study Campus, we give equal attention to all our students and provide a learning environment where their skills and talent can be nurtured in the best possible way. Securing the position of civil servant requires a lot of hard work and efforts. When you get expert guidance in addition to your hard work and efforts, there are high chances that you will stay a step ahead of the other applicants’ and secure a good rank. Being a premier coaching institute for various competitive examinations, we offer result-oriented preparations, so that each of our students’ time is utilized to the fullest by our guidance. We offer qualitative teaching methods that enable students’ to have a better understanding of the topics in an easy way. Our faculty members have diligently prepared a tutorial on each module so that they can deliver quality lectures on each topic included in the syllabus. Apart from our quality and unique teaching methods in conjunction with a high success rate always bring about numerous inquiries from many students. Mulund (East & West), Dombivli, Kalyan, and Bhiwandi are a few locations that account for the maximum number of inquiries. Why enroll at Study Campus? Being prepared by experts always gives you an extra edge over the others. We are pioneers in our field and you can consider enrolling in our institute for the following reasons.